Heller myotomy is the standard surgical procedure performed in patients with achalasia. However, after undergoing Heller myotomy some patients have persistent symptoms of their disease and undergo a redo procedure. 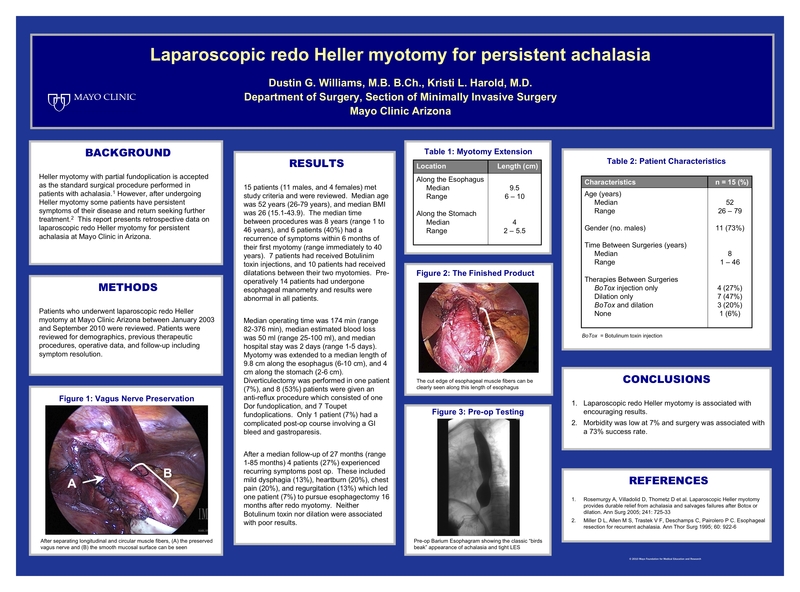 This report presents retrospective data on laparoscopic redo Heller myotomy for persistent achalasia at Mayo Clinic in Arizona (MCA). 15 patients (11 males, and 4 females) met study criteria and were reviewed. Median age was 52 years (26-79 years), and median BMI was 26 (15.1-43.9). The median time between procedures was 8 years (range 1 to 46 years), and 6 patients (40%) had a recurrence of symptoms within 6 months of their first myotomy (range immediately to 40 years). 7 patients had received Botulinim toxin injections, and 10 patients had received dilatations between their two myotomies. Pre-operativly 14 patients had undergone esophageal manometry and results were abnormal in all patients. Median operating time was 174 min (range 82-376min), median estimated blood loss was 50 ml (range 25-100 ml), and median hospital stay was 2 days (range 1-5 days). Myotomy was extended to a median length of 9.8 cm along the esophagus (6-10 cm), and 4 cm along the stomach (2-6 cm). Diverticulectomy was performed in one patient (7%), and 8 (53%) patients were given an anti-reflux procedure which consisted of one Dor fundoplication, and 7 Toupet fundoplications. Only 1 patient (7%) had a complicated post-op course involving a GI bleed and gastroparesis. After a median follow-up of 27 months (range 1-85 months) 4 patients (27%) experienced recurring symptoms post op. These included mild dysphagia (13%), heartburn (20%), chest pain (20%), and regurgitation (13%) which led one patient (7%) to pursue esophagectomy 16 months after redo myotomy. Neither Botulinum toxin nor dilation were associated with poor results. Laparoscopic redo Heller myotomy is associated with encouraging results. Morbidity was low at 7% and surgery was associated with a 73% success rate.